Daihinia is a tool for WiFi. Daihinia turns a simple Ad-Hoc network into a Multi-hop Ad-Hoc network. Multi-hop Ad-Hoc networks offer a higher level of flexibility than the usual Infrastructure Mode: in Infrastructure Mode all the computers have to be in the range of the Access Point, while in Multi-hop Ad-Hoc networks they have to be within one another's range. Daihinia is a must-have for any user with a laptop. Tool for WiFi. It turns a simple Ad-Hoc network into a Multi-hop Ad-Hoc network. a WiFi adapter capable of Ad-Hoc mode. ...... It's a nice idea that a network user supports the network around him/her just by the fact that he/she uses the network. Unlike other solutions that allow mesh topology only between Access Points, Daihinia puts it directly onto computers and does not use Access Points at all. Daihinia is implemented as a network driver for Windows systems and is completely transparent to the programs. * Daihinia is a perfect solution for home and small office networks: wireless computers will use each other to establish a path to the computer that shares its wired internet conection to the wireless mesh network. 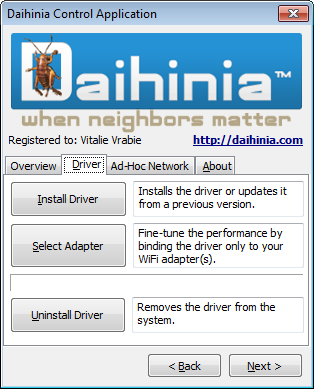 * Daihinia is actually a network driver that is added to your system. Daihinia does not replace your current network adapter but allows you to switch between your regular network adapter and Daihinia. Qweas is providing links to Daihinia 1.5.1 as a courtesy, and makes no representations regarding Daihinia or any other applications or any information related thereto. Any questions, complaints or claims regarding this application Daihinia 1.5.1 must be directed to the appropriate software vendor. You may click the publisher link of Daihinia on the top of this page to get more details about the vendor.